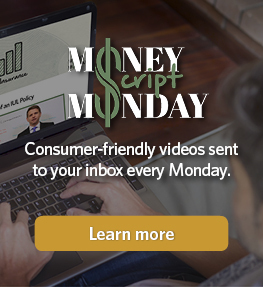 Think about this: Is it easier to ask someone to direct money otherwise going towards groceries or lifestyle to an insurance policy - or - is it easier to show someone already spending money on life insurance how to do it more effectively? By leveraging improvements in underwriting, lower costs of insurance and product innovations, you're able to turn existing clients into new revenue with this marketing program. The process for a review can be very time-consuming and frustrating for both you and the client. Weeks turn into months and months turn into 0 paid cases. With ReProject, all of that becomes turnkey. With just a client signature, everything else is done for you: gather data, compare policy performance, verify company stability, verify ownership and beneficiary designations, review health rating, market analysis and preparation of summary. Cold calling and prospecting typically leads to little or no result. People who have life insurance are often times neglected and possibly exposed to lapses. To inform those individuals who have already been sold on the need and simply require a review of their policy is one powerful tool for both you and the client. The process to review a policy is labor intensive and requires patience. With ReProject, you simply gain permission and we go to work and do the rest for you; comparing policy performance, verifying stability, reviewing health rating, creating easy-to-understand graphs and much more! 7 out of 10 policies that we review show supporting evidence for the need to replace the policy. With our average target being $8,000, you can make a lot of money in little time and also have assurance in knowing that you are doing the right thing. 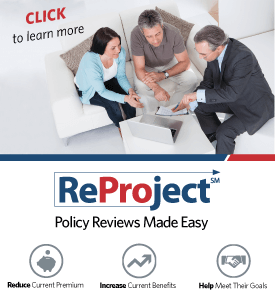 The ReProject marketing program is for the independent financial professional who has an extensive client database that require a review of their life insurance policy - typically, a policy that has been in-force for 3+ years. Another source of activity comes from an advisor who has strategic partnerships, such as a CPA. This works well because the advisor informs the partner of their new service with no cost or time asked of the partner. The partner is then positioned as a great resource for their clients. The ReProject process is simple, yet to begin the conversation of a review can be difficult. We made it easy and supply you with all of the materials you need so that you can begin promoting this service right away! "I now clearly understand Phase One of the plan is to start my business with ReProjects. I will work through 3 IUL policies with 2 at $100K and 1 at $250K and be hand held through the process." 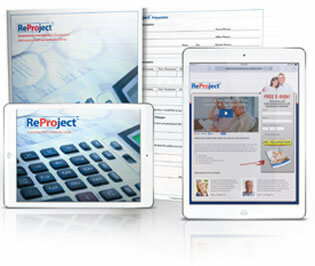 Click the button below to receive a sample report of ReProject in action!